Eclectic Paperie: Home is Where the Mail HeART is ! Happy Friday everyone! It's Toni here to share a bit of 'upcycling' with you. I thought I'd take this opportunity to join in with Theresa's Get Altered Challenge. She is asking us to alter our mail. You really must have a look at her fantastic project, it's an unbelievably brilliant piece of altering. 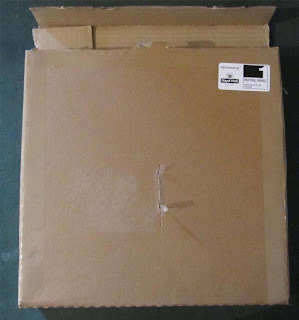 Now I don't get that sort of mail but I do get those wonderful cardboard packages from time to time. Yes crafters you know the ones I mean! 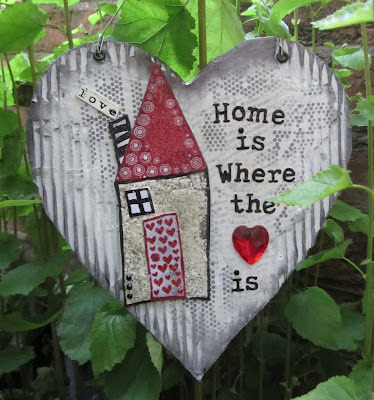 I've used some of the card from a recently received package, to make this wall hanging. This is how I started.... take one cardboard box and deconstruct! 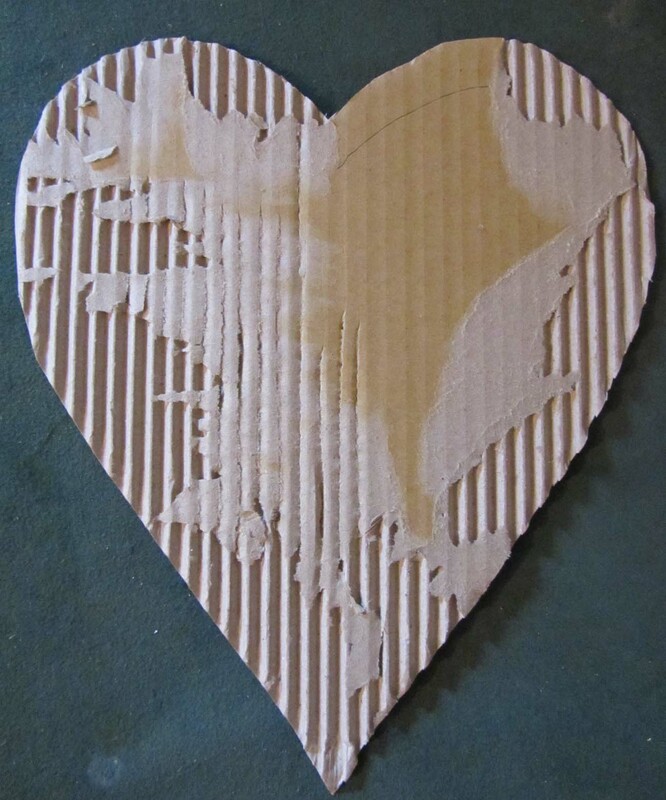 I then used the salvaged card to cut out a heart shape, after firstly drawing around a paper template I made. Next, I tore away some of the surface to expose the corrugations. 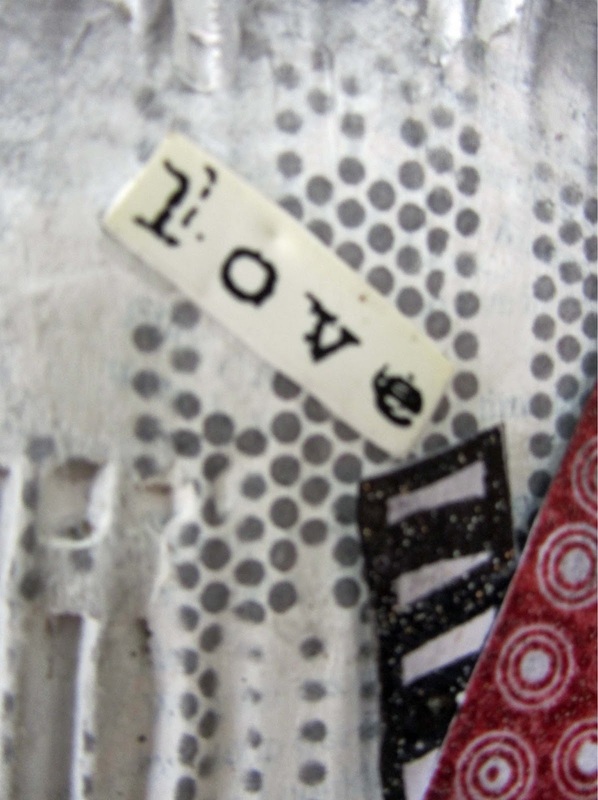 I then collaged some torn book pages over part of the surface adhering with Studio Matte Multi Medium. 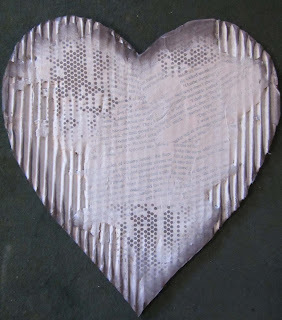 once dry, I gave the heart a light coating of Studio Gessso and applied some Blacksoot Distress Ink through The Crafter's Workshop Tiny Circles stencil and around the edge of the heart. I stamped the house twice on a piece of white card. Once in black Archival ink and once with Fired Brick Distress Ink and embossed the images with clear embossing powder. The stamp is called Heartfelt Warmth and is by Unity Stamp Co. It's actually quite huge and would be brilliant for journalling, I love it. 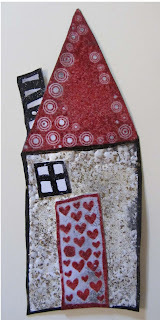 I cut the door, window and roof from the red house and added Shabby White Frantage Embossing Powder to the front of the black house. The embossing powder has very fine gold glitter mixed in so gives a lovely shimmery finish which doesn't really come across in the photos. I reassembled the house and adhered it together with more Studio Matte Medium. 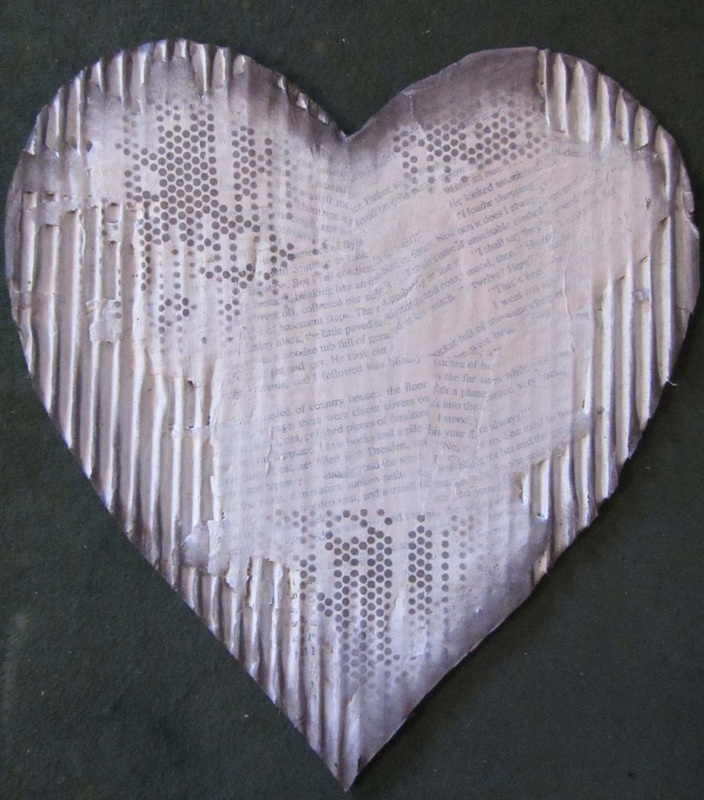 I added a little Black Soot Distress Ink around the edges and the adhered it to the heart. 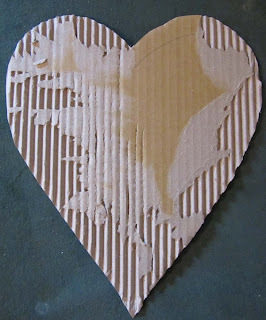 I used dimensional sticky pads to secure the house to the heart. 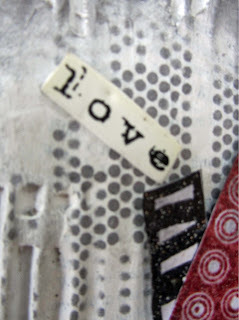 The letters for the sentiment, were cut from black card using a Tim Holtz 'Typeset Alphabet', Sizzlits Die. Each letter has been clear embossed and attached using Glossy Accents. A bit fiddly to do but i think it was worth the effort. The big heart jewel has been on my work desk for a while just waiting to be used. I attached this with Glossy Accents as well. 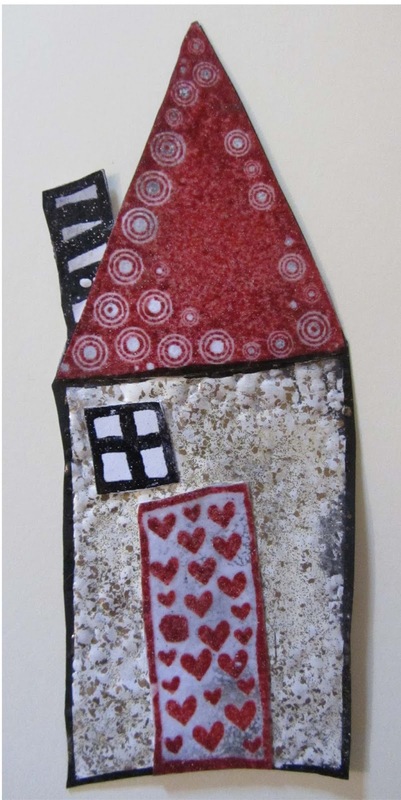 The little 'love' embellishment by the chimney, was made by stamping onto shrink plastic. Absolutely delicious, Toni - I love the Frantaged house-front, and the fabulously shabby chic look (gotta love corrugated cardboard packaging!)... brilliant make! I looove it Toni...my fav Susan K Weckesser stamp set ever,along with the corrugated recycled packaging, a match made in heaven beautifully done!! Way to upcycle! Your heart is SO pretty!!!!! !